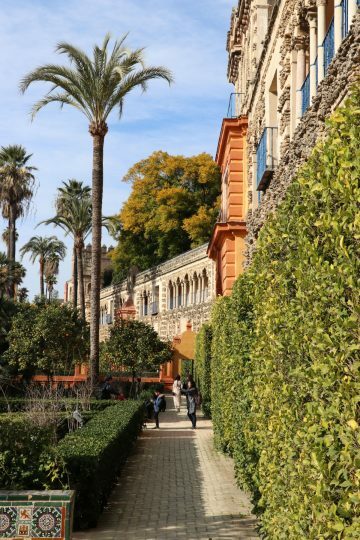 Buy skip-the-line tickets online for the Real Alcazar in Seville with afternoons the best time slots to visit the palace complex and gardens. Buying advance online tickets is the only sensible way to visit the Real Alcazar in Sevilla. 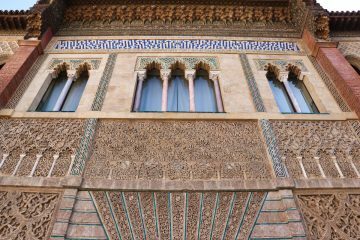 This royal palace complex with a magnificent Mudéjar masterpiece at its core and extensive gardens are justifiably one of the top most popular sights to see in Andalusia and all of Spain. The number of visitors inside at any given time is limited leading to long queues outside of tourists without advance purchase tickets. Waiting can easily be avoided by buying cheap time-slot reservation tickets – afternoons are generally the best time to visit the Real Alcazar. Guided tours are also a good option to enter the Real Alcazar without having to wait in line. Free admission is possible for the final hour on Mondays. The Real Alcazar is one of the most popular tourist sights to see in Spain. It receives nearly 1.8 million annual visitors. Only 750 people are allowed inside the palace complex at any given time with bearers of advance reservation tickets or members of guided tours always receiving preference to visitors queueing to buy tickets. General Admission (Entrada General) — access to the ground floor of the palace complex and gardens. This is the standard ticket that allows a visit without a guided tour. Official audioguides may be added. Buy online in advance. Royal Apartments (Entrada Especial al Cuarto Real Alto) — access to the furnished royal palace upper floor may be added to the general admission. This option is only available in the mornings and uses very strict time slot admission. Online reservations are highly advisable, otherwise make reservations as soon as entering the complex. Guided tours — a variety of options from private tour operators. These tours give immediate access and tour members may of course stay inside the palace complex and gardens at the end of the tour. Tours are often a good late-minute option too to enter the palace without waiting. The best value is often longer tours that combine further sites in Sevilla especially the cathedral – another top sight that no sensible visitor would attempt seeing without an advance purchase ticket. 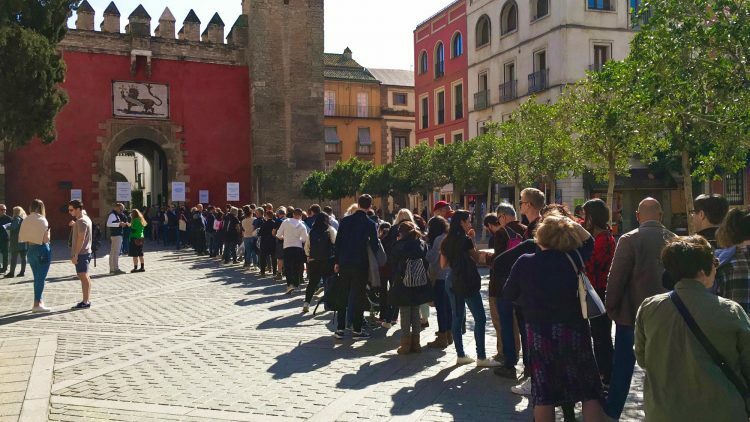 Although it is possible to buy tickets on site at the Real Alcazar, this is a bad option at the best of times turning worse as the number of visitors increases. Ticket lines move excruciatingly slow as the number of people allowed into the complex at any given time is limited with ticket holders receiving preference at all times. Visitors with tickets use the “Visitors with reservations” line and are admitted into the Real Alcazar during the stated time slot – on very busy days, even visitors with reservations may have to wait. If tickets are still available, visitors at the back of the queue will do better by buying tickets on a mobile phone and go straight to the entrance (or go elsewhere and return at the next time slot available). Basic general admission tickets for the Real Alcazar in Sevilla are €11.50 – €3 for students 17 to 25 and pensioners but free for children under 16 (but include them in online tickets). Any advance purchase ticket adds a €1 “telematic” surcharge – a sound investment. Time-slot reservations tickets are cheapest bought online directly from the Real Alcazar website – it is currently fairly badly designed and some details may be in Spanish only. With the printed ticket or mobile phone ticket, use the entrance to the left of the line queuing to buy tickets and go straight in, or on very busy days after a short wait. Buying through resellers such as Ticketbar is also an option and may give savings when combining with further sights and tours. The basic Real Alcazar ticket gives admission to the palace complex and the gardens but not to the optional royal apartments. Although referred to as the “General Tour” ticket, no tour is involved – it is self guided with only a very basic map available for free. An audioguide may be added for around €6. Very little information is on display inside the palace – a good guidebook, an audio guide or guided tours are all sensible options. Buy tickets onsite only on the most quiet days and even during the lowest of low seasons, having time-slot reservations is a wise investment. Almost without exception, “terrible” ratings on TripAdvisor are for people without tickets who unnecessarily queued for hours or failed to get into the Real Alcazar. Admission is free on Monday during the final hour of the day. Buy online tickets (€1) for this time too, as on busy days, i.e. almost all Mondays, visitors queuing without tickets will not gain admission. This free Monday is a good savings option but only when bearing the €1 times lot reservation – the number of visitors allowed into the palace complex remains limited so it is not much more crowded than usual. The Royal Apartments (Cuarto Real Alto) are around 15 rooms on the upper floor of the palace. These may only be seen on an optional tour, which is only possible up to 13:30. Either add the Cuarto Real Alto to the general tour when booking online, or try to make a reservation at the dedicated desk as soon as entering the palace complex. The time on the reservation is for starting the tour — enter the Real Alcazar complex any time before that but at least half-an-hour before to be on time. Admission to the royal apartments is strictly by time slot reservations. Be at the entrance on the second floor on time as it is impossible to catch up once the tour has started. The half-an-hour tour is by audioguide – included for the apartments even if no audioguide is bought for the rest of the complex. Visitors are moved along by security guards, so it is not possible to linger longer in any room. The royal apartments are not much different from any other European royal palace. Although some of the rooms are named after Isabella I of Castile l (Isabel la Catolica) and Pedro I, the furnishings are mostly from the 19th century and thus not particularly old or of much historical importance. The main reception rooms remain impressive. 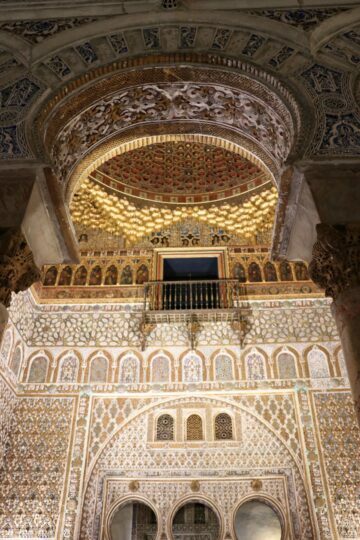 Many visitors having seen other palaces, may consider it €4.50 saved (no discount for children, students or pensioners) by not seeing the upper floor – the Mudejar ground floor of the Palace of Pedro I is very much the top sight of the complex not the royal apartments. 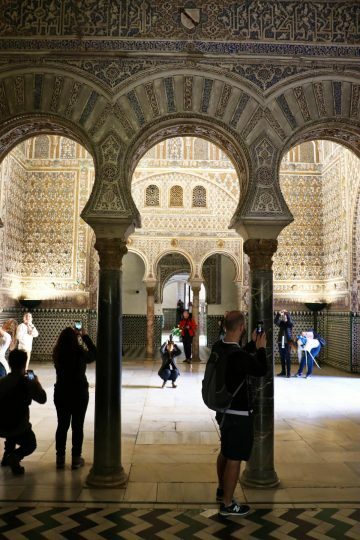 A wide variety of guided tours are available to see the Real Alcazar de Sevilla. Tours are a good option to enter the palace complex without waiting and also a great way to learn more about hidden details — surprisingly little information is provided inside the palace. Game of Throne themed tours are currently very popular too. The cheapest guided tours are usually around an hour but longer tours may offer better value. Better value is also possible in combination tours, especially those including Seville Cathedral – another top sight that is a nightmare to enter without an advance purchase ticket. Family tours are a good choice for visitors with children. Small groups are more pleasant but note that some define small groups as 15 or even 20. At the end of the tour, visitors may stay inside the palace complex and gardens until regular closing time. If that is of interest, ensure that the Alcazar is the final sight seen on combination tours. 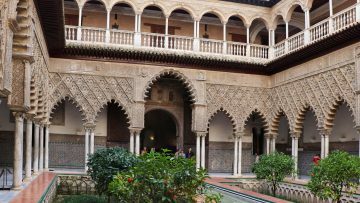 See also more tips on visiting the Real Alcazar, a description of the palace complex highlights and visiting Seville Cathedral.